I’m super duper busy finishing out my Magic Mayhem series. This last book for this trilogy is the hardest, because it’s about a ten-year-old with epilepsy, same as my daughter Elizabeth. We’ve worked together on this book. But it’s difficult to have your child describe to you what it’s like to have these dark spaces she can’t remember, black periods before and after her seizures. 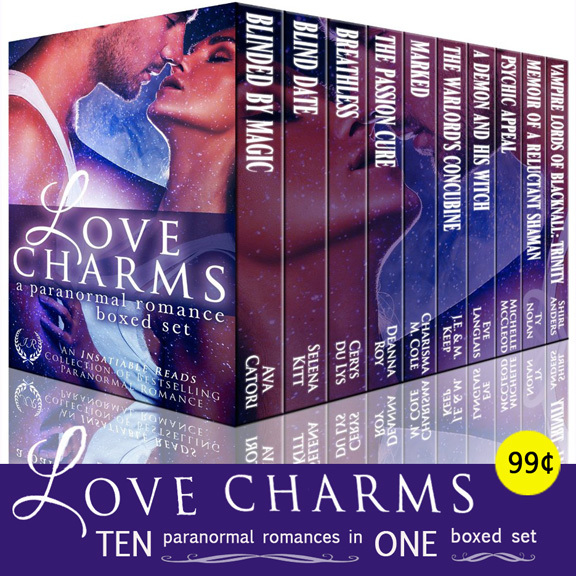 But while I’m doing all this (plus preparing to dive into Forever Sheltered in about a month), a book I sort of abandoned got picked up in a 10-book boxed set of paranormal romances! Authors put together these sets to increase visibility and share fans. Unlike my super-emotional and sad books, my novel in the bundle is light and funny. It’s a voice I set aside when my Forever series took off. My readers want to cry, not laugh! But I let this book go into the bundle. There’s so many great authors in it. And at 99 cents, you can’t beat it for having some choices for your next sleepless night or long trip or need for escape. I hope some of you will try it out. My novel in it is called The Passion Cure, about an enchantress who discovers not only does her family’s pet ferret talk, but it delights to inform her that she’s an outcast in her world, a Nix with no powers of her own. It’s a romp, and an experiment. I had a good time writing it. I have outlined more books in that story world, but I’m not sure I will actually write them since everyone wants the Forever books! So if you want to read my book The Passion Cure, pick up this bundle as that may be the only way you’ll ever get it! Escape into the world of paranormal romance, a magical journey featuring delicious demons, wanton witches, zealous zombies and more! Featuring spell-binding novels from popular New York Times, USA Today, Amazon, and Barnes and Noble bestselling authors, including Ava Catori, Selena Kitt, Cerys du Lys, Deanna Roy and more, these enchanting books will be sure to charm, beguile and bewitch you!